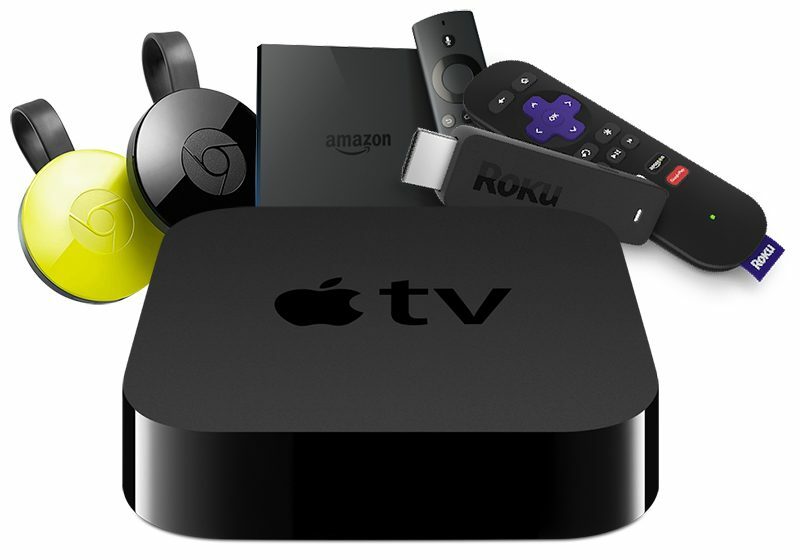 Apple TV was the fourth most popular streaming media player in the United States in the first quarter, behind the Roku, Amazon's Fire TV, and Google's Chromecast, according to market research firm Parks Associates. Parks Associates estimates Apple TV's market share fell to 15 percent in January through March this year among U.S. households with broadband. MacRumors confirmed the survey size was 10,306 households. By comparison, Roku increased its lead in the category to an estimated 37 percent market share in the first quarter, trailed by the Fire TV and Chromecast at an estimated 24 percent and 18 percent respectively. At $149, the Apple TV is also more expensive than any of its major competitors. Roku starts at $40, Chromecast starts at $35, and Fire TV starts at $90, with even cheaper prices often available from resellers. "Higher-priced devices, such as the Apple TV, have not been able to keep up with low-priced and readily available Roku devices, which can be found at Walmart for as low as $29.99," said Glenn Hower, Senior Analyst at Parks Associates. In January, following Apple's first quarter earnings results, financial chief Luca Maestri said Apple TV sales had declined on a year-over-year basis. Exact sales are unknown, as Apple groups the device under its "Other Products" category. The current Apple TV launched in October 2015, ushering in significant changes such as a brand new tvOS operating system, App Store, and a Siri Remote. But, nearly two years have passed, and customers are anxiously awaiting what's next. One of the most desired features is 4K support, and rumors suggest Apple TV fans may soon have that wish granted. In February, Bloomberg reported that Apple was testing a new Apple TV with 4K and more vivid colors that could be released as early as later this year. The report said the fifth-generation model is codenamed J105. The codename, and references to 4K and HDR, have since been found in both the accidentally released HomePod firmware and the seventh tvOS 11 beta. 4K HDR references have also appeared in iTunes. Additionally, in March, developer Firi Games provided MacRumors with evidence of a device identified as "AppleTV6,2" and running "tvOS 11.0" connecting to its arcade game Phoenix HD for Apple TV in its logs. The IP address fell within a range linked to Apple's headquarters in Cupertino, California. The current Apple TV has a model identifier of AppleTV5,3, and Apple TV6,2 does not correspond with any released model. It's conceivable that Apple could launch 4K content in iTunes alongside a new Apple TV with support for up to 4K video output and HDR, or high dynamic range, which allows for sharper colors and lighting. The current, fourth-generation Apple TV has a maximum 1080p video output, and no support for HDR. The high-end iMac models with 4K and 5K Retina displays are currently Apple's only devices that can display 4K content properly. The latest Apple TV lacks the hardware required for 4K and HDR video output. Apple is widely expected to unveil new iPhones at a September event, which it could also use to unveil a new Apple TV. TV is lower on the totem pole because it's higher priced. Why it didn't have 4K in 2015 was ridiculous. I went from an Apple TV user, to a Amazon Fire user because of it. I don't think it's hard to be a leader in this category. The question is: why does Apple refuse to up the mantle? Maybe they should stop holding back features and they would get more market share. I don't really care about 4K right now as I don't have a 4K TV. I do want an Apple TV. But I'm not going to buy a two year old model at the same high price. And I'm not going to buy it without 4K given that it will be something I want in the near future. Apple could also easily make the Apple TV the 4th most popular console (behind Sony, Microsoft, and Nintendo) if they just put a more powerful processor in it and have a standard, first party controller that everyone can use. I chose an nVidia Shield. Without Amazon Prime (I'll take Amazon's side here), Apple TV was a non-starter. Lol this this 1000 times this. There's no way (and no evidence) that people are holding out for a 4KATV. Apple is going to have an INSANE end of 2017. New iPads and Macs (already released, great buys). At $149, the Apple TV is also more expensive than any of its major competitors. Pass. Nvidia Shield TV. That is all.